The Atom iQ line up has been updated for 2016, with three new designs to replace the originals and sit alongside the larger models introduced last year. Each board is available in three constructions – Carbon Ultra Core (as tested here), Wood Reflex or the more price pointed 3DX. 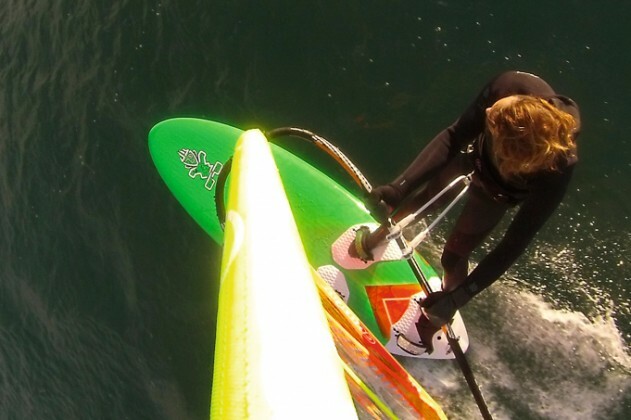 Starboard claim the new Ultra Core is “the world’s lightest windsurfing board construction ever invented”, with a new uni-directional carbon layer used to reduce weight by a quoted 10% and increase strength by 30%. The 114 is one of the wider contenders in the group, yet narrows to a domed tail with cutouts extending along much of the planing rail. 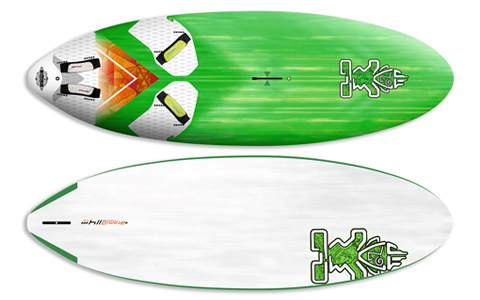 The deck throughout the rest of the board is flat, and comes complete with uniquely contoured deckpads, colour-coded Drake Slick MKIV straps and a wide-profiled G10 fin. Stable and composed underfoot, the new Atom iQ 114 can take large sails with ease to make the most of marginal conditions. We used it with an 8.0m and it didn’t feel out of place at all. Provide power and the Atom accelerates smoothly and progressively providing the time and stability to shift weight to the back of the board and into the straps. Once you’re in place, the Atom seems to engage another gear and kicks on to an impressive top end speed. The deckpad layup in the domed tail is novel, with raised sections under the balls of your feet and dropped heels. It initially feels a little peculiar, but you soon get used to it, and it actually seems to add to the comfort and response over long reaches. The original incarnations of the Atom became sought after for their mix of speed and excitement, matched with control in strong winds and gybing practicality. So we’re pleased to report the new 114 builds upon this trait, retaining this exciting and engaging character. It is certainly still very fast, yet with the larger fin area requires less sensitivity or technique to get the most from it. In the gybe it gives a secure and dependable response, capable of complimenting different rider styles and cutting a safe smooth arc. As such, we’d say that the 114’s performance is even more accessible than its predecessor, making it a great tutor for the progressing rider, yet still possessing enough life and energy to reward the more experienced blasting enthusiast. With a locked-in and engaging character, the new Atom iQ has an immense wind range and real practicality, giving it a wide user appeal. Easy to control, yet coming alight when in blasting mode, the Atom iQ continues to build upon the virtues of the wide-and-thin concept.